Daniel Swift has written for Bookforum, the New York Times Book Review, and the Times Literary Supplement. Yup, it works like a charm. On page 99 of Bomber County you get a war story, a little poetry, some (possibly) dodgy maths, and an anecdote about a craps game between decommissioned bomber crews on Oahu in 1945. You also get to meet John Ciardi, translator of Dante, bestselling American poet of the 1950s, rear gunner on B-29s in the Pacific during the Second World War, all-round man of action and letters who once said, "Whenever my imagination runs cold and deep I go out and look at a B-29 for five minutes and I'm cured" (quoted on p. 99). 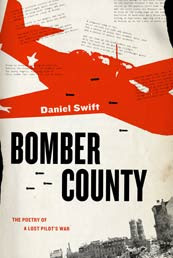 Bomber County is about the strategic bombing campaigns of the Second World War, and the poetry written about those campaigns, both by those in the planes doing the bombing and those in the cities waiting to be bombed. My grandfather was a bomber pilot, with the British RAF, and he was lost in June 1943 on a raid over Germany. I decided to go and find him, and along the way I uncovered many long-forgotten poets, and their stories. Area bombing is a particularly violent, desperate style of warfare, but one of its compensations is the extraordinary culture the experience of bombing produced: amongst poets, photographers, novelists, diarists, journalists, and the many civilians who watched the bombs falling. Ciardi's story tells a little portion of the bigger story of the bombing war, but for me it also sheds light from an unexpected angle upon the life of my grandfather; all are parts of a largely forgotten history, and page 99 is a part of that. 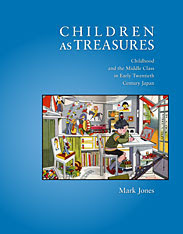 Mark Jones' "Children as Treasures"
Page 99 tells the tale of a group of high-minded scientific professionals—child psychologists, pediatricians, normal school professors—who were eager to become socially influential figures in early 20th century Japan. They, like their counterparts in America, Britain, and Germany, worked to popularize a new science of childhood to the wider public; in particular, they sought every opportunity to teach a new stratum of highly educated mothers how to employ science in the home in order to raise (and love) their children in a child-centered way. Page 99 captures one part of this story—how these scientific professionals engaged in a self-promoting yet uneasy relationship with Japan’s most famous department store, Mitsukoshi, in order to stage wildly popular children’s exhibitions and to vault their ideas and themselves into public prominence. Page 99 reflects the book’s larger purpose—to analyze the numerous groups who worked to reshape the idea of childhood and the daily life of children in Japan from 1900 through 1930. These people, whom I call Japan’s architects of childhood, incarnated three influential visions of the child—as little citizen, superior student, and childlike child—during the prewar era. Although no vision of the child “won out” by 1930, the vision of the child as superior student was beginning to carry the day, as aspirational mothers, profiteering publishers, and influence-seeking teachers cooperated to spread a widely appealing belief—as they put it, “Any child can become a superior student.” These groups propagated the notion that early 20th century Japan was leaving behind a feudal past to become a modern meritocracy; as part of that process, they promoted a vision of the child as a striving student able to achieve educational success and social mobility. The result was the birth of the educationally obsessed family, headed by the (in)famous “education mother” and dedicated to helping the child navigate the new meritocratic world of the modern school system. This type of family became the norm in 20th century Japan and, interestingly, is also becoming commonplace today in other regions of the world, such as South Korea, China, the United States, and elsewhere. Michael T. Bernath's "Confederate Minds"
During the Civil War, white southerners used pens and printing presses, as well as swords and cannon, to fight for their independence. My book examines the wartime efforts of Confederates to create a uniquely southern literature and culture, and thus prove the distinctiveness of the southern people and legitimate their desire for a separate national existence. Independence won on the battlefield would be meaningless so long as southerners remained in a state of intellectual “vassalage,” dependent on the North for their books, periodicals, and teachers. For this reason, the war did not stop cultural life in the South. Instead, the production of new Confederate periodicals, books, and textbooks accelerated at an astonishing rate, as southern writers and publishers rushed to provide their new nation with its own literature. In this tremendous outpouring of native print, cultural nationalists believed they saw the Confederacy coalescing into a true nation. Momentous historical events inevitably spawned ‘‘periods of great intellectual activity,’’ these nationalists assured themselves. For, as Professor A. B. Stark explained, ‘‘When the minds and passions of men are aroused by these political upheavals, they must manifest and body forth themselves in some form.’’73 Neither Stark nor Haygood had any doubts about how these heightened passions would manifest themselves in the Confederacy. ‘‘Great moral, or political, revolutions nearly always inaugurate new eras in literature,’’ Haygood intoned. ‘‘We are now in the midst of great revolution—we are to be ‘a peculiar people,’ and our literature ought to bear the impress of our distinctive characteristics. It must, then, be created; and never was there a more glorious prospect than is now inviting Southern talent.’’74 Breathing the rarefied air of their new nation and confronted with daily examples of unprecedented heroism and valor on the battlefield, Confederate writers and poets could not help but be inspired to excellence. While page 99 captures well the spirit and vision of Confederate nationalists at the start of the war, it does not speak to what Confederates actually did in their attempt to secure southern intellectual independence during the war – the periodicals they launched, the books they published, the poems they wrote, the plays they produced, the critiques they leveled – which is the focus of the bulk of my book. Nor does it mention the related and essential campaign for southern educational independence in which Confederate teachers and educational reformers sought to liberate southern children from the pervasive and, in their view, insidious influences of the North by writing and publishing their own textbooks, training and hiring their own native teachers, and supporting their own native schools. In the end, Confederates proved no more able to win their intellectual independence than their political freedom, though they struggled mightily for both. By analyzing the motives driving the struggle for Confederate intellectual independence, by charting its wartime accomplishments, and by assessing its ultimate failure, my book makes provocative arguments about the nature of Confederate nationalism, life within the Confederacy, and the perception of southern cultural distinctiveness. Learn more about Confederate Minds at the publisher's website. Not in the case of my book on Dreyfus – only some of the major themes are alluded to. Page 99 is half used up by illustrations, but it is not a picture book, although it does bring into focus the importance of the Affair first and foremost as a spy story . One of the first, in fact, replete with tales of stolen documents, forged evidence, people in disguises. There were agents, double-agents and spymasters. Mysterious women (invented) delivering messages while shrouded in black veils, and debauched scoundrels who sold secrets to pay gambling debts. All this is alluded to on page 99. But the spy story did little more than get it all going. Captain Alfred Dreyfus was a French Jewish soldier falsely accused of espionage at the end of the nineteenth-century. His case – which pitted supporters of the army against supporters of justice from 1894 until his exoneration in 1906 – tore France apart, became an international scandal and set off political shock waves which have lasted to this day. From then on it became a battle of high principle and low politics which sucked in the greatest in the land – presidents, premiers, authors and scientists. The “intellectuals” made their first appearance on the stage. Old friends lied to each other, new and unlikely alliances were formed. Some rallied meetings of tens of thousands of people and led street riots, others consulted mediums to gain a mystical insight into events. It was a battle of beliefs and ideas as much as of spies, a contest of fundamental ideas and personal philosophies about the essence of what it is to be French and a citizen – and whether that was compatible with parallel identities as a Jew, a Protestant, a Catholic or – nowadays – a Muslim. Page 99 has little to say on this: it alludes to the spying, the political manoeuvring; the reader meets some of the most important actors -- Esterhazy, the real spy; Picquart the soldier jailed because he thought Dreyfus innocent; Schwartzkoppen the German spymaster; Scheurer-Kestner, the venerable Senator who risked his reputation for Dreyfus and died of cancer the day of his release; Billot, the minister who blocked attempts to investigate the case. But you will not find out what made them all tick, why they took the positions they did. For that, you will have to read on…. Tom Grimes directs the MFA Program in Creative Writing at Texas State University. He is the author of five novels, including Season’s End, City of God, and Redemption Song, and the editor of The Workshop: Seven Decades of Fiction from the Iowa Writers’ Workshop. His work has been selected as New York Times Notable Books of the Year, and he has twice been a finalist for the PEN/Nelson Algren Award. I was surprised and saddened when I opened Mentor to page 99. Although the memoir is largely about my friendship with Frank Conroy, and the experience of my writing life with him, page 99 refers to my play, Spec, and its production in Los Angeles during the time I was an Iowa Writers Workshop student in 1991. I had set aside my novel Season’s End to spend six weeks in L.A. the summer the play was produced. While I was there, I sat through hours of rehearsals every day, and then spent time with the cast and crew backstage every night. We drank, talked, and quickly I became close friends with the play’s producer, who happened to be a great actor known for his originating roles in Sam Shepard’s plays, including one in Buried Child, which earned him a Tony nomination. He was James Gammon and on page 99 I wrote about the evening we met. He didn’t know I was writing a memoir, but I planned to mail him a signed copy as soon as I received my books from Tin House Books, my publisher. They arrived last month – late July, 2010. The day after they arrived, I learned that Jimmie (as I and everyone else called him) had died of cancer a week earlier. I spoke with his wife, Nancy, and promised to send her a signed copy in Jimmie’s memory. But I was struck by something about the nature of memoirs I hadn’t considered until that moment. I’ve written five novels, but Mentor is my first and perhaps the only memoir I will ever write. So, never before had I encountered the fact that someone I had written about was dead, truly dead, not fictional, make-believe dead. In fiction, even if your characters die, they’re still alive, in a way. All you have to do to bring them back to life is reread the book. But with a memoir the people you’ve loved are dead, dead forever. Memoirs, I learned, are ultimately about mortality. We recollect events and feelings from our past, but we’re unable to hold onto them, or to the people we knew. After I’d read page 99, I counted the number of people I’d written about in Mentor who are now gone. I hadn’t realized how much of my past has vanished. And should I ever reread Mentor I’ll do so with a sense of melancholy. But by opening my book I can recall the life we shared, even though I know I can never have it back. Eric Jay Dolin's "Fur, Fortune, and Empire"
Eric Jay Dolin is the author of Leviathan: The History of Whaling In America, which was chosen as one of the best nonfiction books of 2007 by the Los Angeles Times and the Boston Globe, and also won the 2007 John Lyman Award for U. S. Maritime History. A graduate of Brown, Yale, and MIT, where he received his Ph.D. in environmental policy, he lives in Marblehead, Massachusetts. Fur, Fortune, and Empire is a story about how America was transformed from a loose collection of colonies into a transcontinental nation. A major part of that story revolves around the clashes between various empires—French, Dutch, English, Russian, Swedish, and Spanish—seeking to control the North American fur trade, and by extension, the continent itself. Page 99, although not one of the more stirring passages in the book, offers a glimpse of the revival of the French fur trade after many years of struggle. France was the first imperial power to establish fur trading posts on the eastern edge of the continent, in the late 1500s. The French colony, New France, recorded its best trading year ever in 1646, shipping out more than 33,000 pounds of pelts, predominantly beaver. But growing violence in the wilderness overshadowed this success. The Iroquois were viciously attacking New France’s Indian allies, including its main trading partner, the Huron. The attacks were part of the Beaver Wars, so named because historians originally believed that they were motivated primarily by the Iroquois’ need to find new sources of beaver to trade with the Dutch, and the Iroquois thought that the best way to find those sources was to attack other Indians and take their furs and land. In more recent scholarship, however, the Beaver Wars are seen in the context of mourning wars, which were a traditional means of rebuilding a tribe’s strength after many of its members had been killed or died—in this case as a result of a series of smallpox epidemics that had devastated the Iroquois. Whatever the cause, the results of the Beaver Wars were the same. The Iroquois virtually destroyed the Hurons, and in the process brought New France’s fur trade to its knees. In subsequent years the range of the Beaver Wars expanded as the Iroquois attacked other Indians, further crippling the French-Indian trade. As a result, by the early 1660s, New France’s fur trade was for all intents and purposes “dead”—although only temporarily. Exploration was another reason for the revival of New France’s fur trade. Frenchmen whose names now dot America’s landscape ventured west and south to claim new lands, establish trading ties with local Indians, and find a water route to the western ocean. Among the first to set out were the Jesuit priest Jacques Marquette and the fur trader Louis Joliet. Lured by tales of a great river—which the Indians called the Meschacebe, or the ‘Father of Waters’—to the south of the Great Lakes, Marquette and Joliet launched an expedition in the spring of 1673 to see if the tales were true, and to discover into which body of water this great river emptied. With five Indian guides they journeyed in birchbark canoes to Green Bay, ascended the Fox river, portaged to the Wisconsin, and proceeded to its terminus, where they found the Father of Waters, which would later be called the Mississippi. Read an excerpt from Fur, Fortune, and Empire, and learn more about he book and author at Eric Jay Dolin's website. Kelly M. Greenhill's "Weapons of Mass Migration"
Kelly M. Greenhill is Assistant Professor of Political Science and International Relations at Tufts University and Research Fellow at Harvard University’s Kennedy School of Government. Coercion is generally understood to refer to the practice of inducing or preventing changes in political behavior through the use of threats, intimidation, or some other form of pressure—most often, military force. Weapons of Mass Migration (WMM) focuses on a very particular nonmilitary method of applying coercive pressure—the use of migration and refugee crises as instruments of persuasion. This kind of coercion can succeed in large part because of the very real fears that uncontrolled cross-border population movements tend to generate within those societies expected to bear their political, social and monetary costs. Indeed, long before September 11 galvanized a new preoccupation with border security, refugees and illegal migrants had transmuted in many countries from a matter of low politics to high politics, involving a shift in the definition of national security threats and the practice of security policy. At the same time, many of these self-same societies are legally, if not morally, obligated to welcome those fleeing violence and persecution. Reconciling competing imperatives to keep people out while also letting them in can be challenging, if not simply impossible. Under such circumstances, incentives to concede to coercers’ demands—in exchange for making a mass migration stop or simply evaporate—can be quite powerful. Page 99 discusses the United States’ confused and muddled initial response to the 1980 Mariel boatlift, one of three attempted cases of Cuban-initiated migration-driven coercion examined in Chapter 2. Although Mariel has been traditionally viewed as the result of a fit of pique by Cuban President Fidel Castro, WMM shows that it was in fact part of a concerted effort by Cuba to materially change US foreign and immigration policy by flooding the country with what were often referred to as “undesirables”. As a consequence, 125,000 additional Cubans emigrated to the US in a five-month period, including a non-trivial number of criminals and the mentally ill. Castro, for his part, extracted a new immigration accord and a crackdown on Cuban hijackers, while US President Jimmy Carter attributed his subsequent loss in that fall’s presidential election in no small part to the immigration crisis. And, as the book makes clear, Mariel was far from unique. WMM identifies at least 57 documented cases of this kind of coercion since ratification of the United Nations Convention on Refugees alone, well over half of which allowed coercers to achieve at least some of their objectives—objectives that have ranged from monetary payoffs and foreign aid to full-blown military interventions and even regime change. Indeed, attempts to employ this kind of coercion have influenced foreign policy—and continue to do so—in domains as wide-ranging and diverse as the US’s decision to escalate the war in Vietnam in the 1960s as well as to intervene in Bosnia and Kosovo in the 1990s; the European Union’s resolutions to end sanctions against Libya in the early 2000s; and China’s relatively quiescent stance regarding North Korea’s nuclear program today. Although heretofore a phenomenon that has been “hiding in plain sight,” WMM demonstrates that mass movements of people can be powerful, if tragically exploited, policy weapons. Learn more about Weapons of Mass Migration at the publisher's website. Erika Doss is professor of American Studies at the University of Notre Dame. Her books include Benton, Pollock, and the Politics of Modernism: From Regionalism to Abstract Expressionism, Looking at LIFE Magazine, and Twentieth Century American Art. Consider the narrative codes of mourning devised by the New York Times in its nationally-syndicated "Portraits of Grief" column, which first appeared three days after 9/11 and continued until late December 2001. Initially called "Among the Missing," the Times' series originated with the missing-persons flyers that circulated immediately after the collapse of the Twin Towers. Featuring personal details and photographs, these Xeroxed flyers were posted on every public surface near Ground Zero, and then, as the missing became the dead, formed the basis for many temporary memorials. Impressionistic and ritualized, much like the memorials on which they were modeled, "Portraits of Grief" were snapshots of affect: two hundred-word profiles, usually accompanied by tiny head-shots, which casually sketched the preferred pastimes (parties, dancing, golf, fly-fishing) and endearing qualities (loved to laugh, loved to cook) of 9/11's victims. Intimate and anecdotal, these sketches were the seeming antithesis to the cold eulogies of the typical newspaper obituary--much as temporary memorials are often cast as the emotional opposites of permanent stone and bronze monuments. Page 99 is toward the end of a chapter in Memorial Mania titled "Grief: Temporary Memorials and Contemporary Modes of Mourning," which focuses on what I see as changed cultural and social practices of public mourning in the United States. As I ask more specifically on page 64: "How are feelings of grief mediated in contemporary America? What do temporary memorials tell us about who and what is deemed memorable in American history, and in terms of an imagined national future? By extension, is grief a useful or productive public affect? Or are there psychic and political dangers for a nation seemingly "too attached" to public expressions of grief?" Memorial Mania opens with these questions: Why do we make memorials in America today—and why do we make so many of them? I find answers in the fevered pitch of public feeling in America today, including grief, gratitude, fear, shame, and anger. Pairing discussions of particular memorials with the affective conditions in which they are imagined, experienced, and understood, each chapter of Memorial Mania explores the cultural, social, and political conditions that inform today's urgent feelings about history and memory. Increasing numbers of temporary memorials, for example, like those discussed on p. 99, suggest how new understandings of grief and citizenship are being framed in America today. Memorials that commemorate the victims of terrorism, like the Oklahoma City National Memorial and various 9/11 memorials, simultaneously embody widespread fears about the state of the nation and equally emotional narratives about social stability and national security. Scores of new war memorials, including the National World War II Memorial, negotiate the terms of gratitude and what it means to say "thank you" in America today—and to whom. A growing body of shame-based memorials, including those that address the subjects of slavery and lynching, challenge standard accounts of a progressive national narrative and raise questions about how to remember, represent, and perhaps redeem the nation's shameful histories of racial violence and intolerance. And memorials that pay tribute to Spanish conquistadors in the American southwest are framed by angry debates over revisionist history and foundational myths. On the whole, page 99 is a good representative of Memorial Mania's primary objective--which looks at today's growing numbers of memorials to show how fresh insights about American history, memory, and self and national identity are especially realized through the lens of public feeling. Learn more about Memorial Mania: Public Feeling in America at the University of Chicago website. Rachael Stryker's "The Road to Evergreen"
Rachael Stryker is Visiting Assistant Professor of Anthropology at Mills College, and the author of several articles on international and domestic adoption. She is currently at work on a book connecting anthropology to public life, Public Interest Ethnography: A Primer. P. 99 is remarkably representative of this book as a whole. 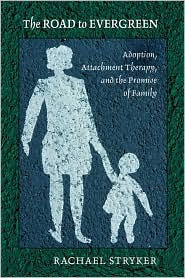 The page marks the beginning of an analysis of chapter four (titled “Prisoners in Our Own Home”), which outlines the processes by which adoptive parents come to embrace the Reactive Attachment Disorder (RAD) diagnosis to explain the challenging postplacement behaviors of adopted children, as well as parents’ decision to bring their children to undergo controversial models of attachment therapy in Evergreen, Colorado (think “emotional boot camp” for kids). The page also begins by highlighting a paradox: adoptive parents in the United States understand parental love as a curative agent, one that is expected to heal the emotional wounds of formerly institutionalized adoptees caused by abandonment and/or orphanhood and help integrate the child into the new family. However, parental love often fails to turn formerly institutionalized children toward the adoptive family – in fact, adoptees (and particularly those who have been severely abused, who have spent long periods of time in institutions and/or who have been adopted at older ages) may feel much conflict, confusion, and psychic pain in response to parental love as it is expressed through the nuclear family. Parents must thus find other ways to inculcate the impulse toward emotional reciprocity within children, sometimes turning to medical professionals like those who practice the Evergreen model of attachment therapy, particularly because they are experts who promise to help parents emotionally manage the children and project an affective future for their family once again. The promise of rebuilding the adoptive family is an alluring one for adoptive parents whose postplacement expectations have been dashed, one that can overshadow the dangers or consequences of the methods used to procure the prize. Adoptive parents undoubtedly learn that the Evergreen model of attachment therapy is controversial and possibly detrimental to children’s emotional and physical health. Still they are drawn to it. On p. 99, I demonstrate that adoptive parents often treat the RAD diagnosis as a “black box” (Latour 1987), that is, as “a mechanism that is so complex in terms of its history or inner workings that one does not care how it actually works but only how much input he or she needs to provide to achieve a desired result (in this case, child love).” In other words, when adoptees frustrate the hegemonic logic of the nuclear family through their challenging behaviors, parents typically do not investigate their own actions, expectations for, or models of the family. Instead, they are elated to discover that there may be a reason for their children’s behaviors that have nothing to do with their own parenting practices – one that may find a “quick fix” through professional intervention. In addition, I argue that the RAD diagnosis operates as what medical anthropologist Howard Stein (1985) has called “a signal symptom,” that is, a medical diagnosis borne from a shared social conflict that is intended to displace and direct elsewhere the location of that conflict, thereby allowing society to focus and distract them selves its actual source, which can be overwhelming to all involved. In this case, the RAD diagnosis allows parents to locate the problem solely within the promising and more optimistic realm of the reparable emotional disorder, rather than look systemically at child circulation systems that are, in fact, not necessarily child-centered. When someone picks up The Road to Evergreen and turns to p. 99 then, what she or he will get is a glimpse of the way the book as a whole challenges readers not just to rethink motivations for the pathologization of formerly institutionalized adoptees, but to also recognize some important contradictions inherent in adoption systems in which formerly institutionalized children are regularly called upon to help individuals build their nuclear families. Learn more about The Road to Evergreen at the Cornell University Press website. Mitchell Aboulafia is Director of Interdivisional Liberal Arts and Professor of Liberal Arts and Philosophy at The Juilliard School. His books include The Cosmopolitan Self: George Herbert Mead and Continental Philosophy (2001). Lately there has been a spate of articles and books in both popular and scholarly venues that emphasize the importance of empathy in moral development. Many of these works, including those by philosophers, have drawn on contemporary research in psychology and biology. For example, authors such as Frans de Waal approach the issue by documenting ways in which human behavior is similar to animal behavior. What is striking about much of this work is the extent to which it not only recapitulates arguments about moral sentiments made by philosophers in the eighteenth and nineteenth centuries, but how it typically overlooks the efforts of pragmatists writing in the middle of the last century. The work of George Herbert Mead is especially noteworthy here. He specifically addressed the relevance of sharing the attitudes of others in moral and social development. The pragmatists can help us navigate challenges and perplexities generated by approaching morality from the vantage point of empathy. Transcendence: On Self-Determination and Cosmopolitanism addresses different ways of thinking about empathy and sympathy that are consistent with the contributions of classical pragmatists, for example, Dewey, James, and Mead. It provides ways for appreciating the strengths and limitations of “empathic” approaches, in addition to showing how they can be related to self-determination and cosmopolitanism. Page 99 discusses one of the problems involved in viewing moral development in terms of taking or sharing the perspectives of others. The title of the chapter is “W. E. B. Du Bois: Double-Consciousness, Jamesian Sympathy,and the Cosmopolitan.” The passage below occurs in the middle of a discussion of Du Bois’s notion of double-consciousness. If one has to expend too much of one’s resources trying to see oneself through the eyes of the other, one loses oneself or one becomes split, a divided self. So the Jamesian model, and Mead’s for that matter, which claims that impartiality is nurtured through individuals taking multiple perspectives, must come to terms with the reality that seeing oneself through the eyes of others can in fact be a damaging experience. Under certain conditions the self can as easily become alienated from itself as it can be led to expand its horizons through taking the perspectives of others. The previous chapter on Mead and cosmopolitanism provided an account of impartiality in which impartiality is not understood as a view from nowhere. Page 99 continues the discussion of impartiality in light of Du Bois’s insights. Those who have a double-consciousness are in a unique position to achieve the impartiality of the spectator because of a heightened awareness of otherness and multiplicity. This in fact can be a resource for marginalized peoples. Multiple standpoints can lead to a breadth of vision and insight not possessed by dominant groups. Yet this advantage can be undermined through the alienation inherent in dominant/subordinate relationships. The participants in these relationships are not disembodied spirits. Those who are subordinate become frustrated and angry at those who compel them to see the world as they do. Du Bois confronts us with how asymmetry in power relations, which in his analysis is tied to racism, can undermine the best intentions of actors regarding sympathetic or impartial responses to others. To state the obvious, one cannot expect individuals to respond sympathetically under the yoke of oppression. In fact, the oppressed are confronted with a hostile, invasive “critic,” who often appears under the guise of an impartial spectator. This is crucial. Those in the dominant position often have the luxury of appearing to be impartial or benevolent. But if there is no mutuality, no basic respect for the humanity of the other, the result is not impartiality but paternalism. The undermining of the “impartiality” of those who are subordinate through the interior “critic” cannot be separated from the way that the Veil prevents those who dominate, those who see themselves as more human than the other, from truly sympathizing with others. Asymmetrical relations undermine “natural” sympathetic responses for all those involved. For those who dominate, pity can become conflated and confused with sympathy. And pity infantilizes. 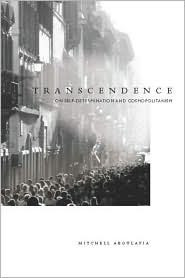 The “Introduction’ and “Afterword” to Transcendence can be found on Stanford University Press’s web site. Cynthia Wachtell's "War No More"
Cynthia Wachtell is the author of the new book War No More: The Antiwar Impulse in American Literature, 1861-1914 and an assistant professor of English at Yeshiva University in New York City. Only in his writings published long after the war, most extensively in Specimen Days, did [Whitman] publicly weigh other interpretations of the conflict and hint at his own dismayed response to the carnage. The seething hell of the real war – the realist’s war – would never get in the books. At least, it would never appear in Walt Whitman’s Leaves of Grass. Those three sentences pretty well capture what I have to say about Whitman and also hint at what I have to say about the Civil War generation of writers as a whole. During the Civil War years and the decades that immediately followed, the war was written about in a highly conventionalized and sentimentalized way. Men fearlessly breasted battle’s waves. They died as heroes on the battlefield. They were promptly buried in tidy graves. That, at least, is how things were presented on the pages of popular literature. There was little tolerance for writers who challenged this highly romantic and sanitized way of writing about war. Yet within their private and public writings, certain authors – including Herman Melville, Nathaniel Hawthorne, and Walt Whitman – did dare to question the morality of war and to record their horror and dissent. As I show in my chapter on Whitman, he penned some of the most overtly antiwar lines of the entire Civil War generation, but he did so almost entirely within the privacy of his own diaries. In late 1862 Whitman traveled to Fredericksburg, Virginia, soon after the North was defeated there in battle. In Fredericksburg he encountered “a heap of feet, legs, arms, and human fragments, cut, bloody, black and blue, swelled and sickening” outside an improvised field hospital and saw discolored and bloated corpses of soldiers left, as yet, unburied. Profoundly disturbed, Whitman wrote in his journal, “O the hideous damned hell of war.” But he did not include the line, or other lines like it, in his published poetry. As the nineteenth century wore on and the modernization and mechanization of war became ever more evident, antiwar writing gained in popularity. Mark Twain, Stephen Crane, and Ambrose Bierce, wrote their share of unsettling antiwar works. And America’s turn-of-the-century wars in Cuba and the Philippines invited even more dissent. Ironically, on the eve of World War I, antiwar literature and pacifism had never been more popular in America. That’s the quick take on War No More’s short page 99. Walt Whitman kept his darkest thoughts about war to himself. Later generations of American antiwar writers did not. Sadly, the “hell of war” continues. Visit the War No More website. Michael L. Frazer's "The Enlightenment of Sympathy"
Michael L. Frazer is an Assistant Professor of Government and Social Studies at Harvard University. His research focuses on Enlightenment political philosophy and its relevance for contemporary political theory. Unlike the mechanism of emotional infection, the mechanism of projective empathy involves discretion on the part of the spectator as to whether sympathy is called for. As [Stephen] Darwall has observed, empathetically placing ourselves in another’s situation and imagining how we would respond emotionally “puts us into a position to second the other’s feeling or dissent from it,” depending on whether the other’s feelings seem “warranted by features of the situation to which they apparently respond ... 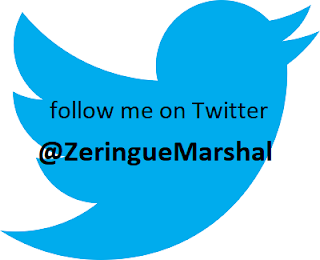 If one is inclined to believe that another’s feelings are not warranted by her situation,” Darwall reasons, “this will make it more difficult to share them through projective empathy. Indeed, one’s relative inability to empathize will itself be an expression of thinking the other’s feelings to be unwarranted.” This, in turn, suggests an obvious reason why sympathy would always be, in some respect, pleasant for all parties involved. A hospital may not be a more pleasant place than a ball, but whether on the dance floor or in the emergency room we always crave the approval of those around us and we generally also prefer to approve of our fellows rather than to disapprove of them. The degree of one’s sympathy with another, both in Smith’s system and in ordinary language, implies a proportionate degree of approval. This debate between Hume and Smith on page 99 is remarkably representative of The Enlightenment of Sympathy as a whole. It involves a particular issue—the nature of sympathy, and its relationship to our emotional commitment to justice and virtue—of central importance to the book. (The debate at hand is about the “hinge” of Smith’s philosophy, after all.) But page 99 also ties in with larger arguments about the richness and diversity of the sentimentalist strand of Enlightenment thought, as well as its continuing relevance for us. The disagreement between Hume and Smith was not merely a tiff between two long-dead Scotsmen, but is still alive in academic discourse, political debate, and even in our personal lives. Is sympathizing with someone in pain itself painful? If so, why do the suffering crave the sympathy of others, and why do others agree to provide it? And does sympathizing with someone imply approving of them in some way? Philosophers and social scientists still wrestle with these questions, but so does anyone who has to decide between visiting a sick friend and heading out for a night on the town. Learn more about The Enlightenment of Sympathy at the Oxford University Press website. Hiroshi Kitamura is Assistant Professor of History at the College of William and Mary. This visual ad reveals a lot about Hollywood’s expansion in early post-World War II Japan – the subject of my book. During the six-and-a-half year occupation period, U.S. studios chose not to sell their films as “pure entertainment,” but extended their influence as a source of both “amusement” (goraku) and “intellect” (kyoyo). This wide-reaching filmic campaign disseminated over 600 feature films, helped render Japan a lucrative film market, and assisted Douglas MacArthur’s efforts to “reorient” the former Axis enemy. Once the floodgates of U.S. cinema opened, scores of movie-goers flocked to the theaters to savor the newest Hollywood releases. Many of them formed fan clubs to appreciate U.S. cinema as members of a larger community. Studying Hollywood in early postwar Japan aids our understanding of some broader trends and themes. First are the workings of U.S. soft power. In my case study, we see the American film campaign as a systemic process, achieved through close working relations of the U.S. government, military, and film industry. Second is the widespread popularity of U.S. cinema, particularly among the elites but also among many other consumers (including the youth). Finally, we see the rapid penetration of American popular culture – a trend that we continue to see in Japan after the occupation. In this sense, the Rhapsody in Blue ad helps illustrate a larger institutional process that has contributed to the growing transpacific influence of Hollywood and the United States over the past several decades. Learn more about Screening Enlightenment at the Cornell University Press website. Ian Tyrrell's "Reforming the World"
Ian Tyrrell is Scientia Professor of History at the University of New South Wales, Sydney, Australia; and Harmsworth Professor of American History at Oxford University, for 2010-11. He has written, among other books, Transnational Nation: United States History in Global Perspective since 1789 (Palgrave Macmillan, 2007). Ever wondered where Americans got the idea that they could save the world? One place to start looking for an answer is Reforming the World: The Creation of America’s Moral Empire. The page 99 test leads straight to a humanitarian urge. Here the book begins to tackle the question of why there was a sudden surge in humanitarian sentiment in the 1890s. Certainly “Long before the 1890s the people of the United States had shown interest in the plight of the less fortunate abroad.” But Americans accelerated their concern after 1880, spurred by missionaries abroad and a web of transnational reform organizations. Readers learn that Americans donated to and formed support groups for the South Asian educator and cross-cultural figure Pandita Ramabai. American aid to Ramabai’s work “for high-caste Hindu child brides became a prototype for later activities” in the reforming impulse. A cast of characters that includes temperance reformer France Willard and the evangelical leader of an extraordinary mission outburst in that decade, John Mott, make page 99 cameo appearances in supporting roles, as Americans moved out from their inward-looking concerns to see the world as their field to change morals, relieve suffering and reform the world. The page raises an old argument, often dismissed, but now put in proper context. The drive of Americans to relieve suffering in Spanish-controlled Cuba in 1897-98 prior to the Spanish-American War became a humanitarian justification for that war. The imperial adventure it started is not discussed on this page, but the parallels are unmistakable. In the 1950s, prominent historian Richard Hofstadter interpreted the spirit of 1890s expansionism, relating it to psychological anxieties and the American public’s increasingly bellicose temper towards Spain. For Hofstadter the sources of this humanitarianism and imperialism in the Progressive Era lay inward, in the traditional narrative of American history’s dynamic outward drive, but in this book, American empire has its origins in missionary and humanitarian transnational encounters that spin a web of obligations encouraging Americans to take action against Cuba in 1898. The running head on page 99 is “BLOOD, SOULS, AND POWER”, and on this page "body and soul” is the real humanitarian concern. To find the blood and power, and where it all led for America in the imperial imbroglio of the Philippines and beyond, it’s necessary to read the whole book. Stephen J. Rockwell's "Indian Affairs and the Administrative State in the Nineteenth Century"
Stephen J. Rockwell is an associate professor in the Department of Social Sciences at St. Joseph's College, where he is also the coordinator of the American studies program. Big government won the West. Our national myth of pioneers settling an open, unpeopled West—only to suffer the intrusions of big government later on—ignores the ways in which the federal government worked to craft and control westward expansion, long before US settlers got there. To Ford Madox Ford’s credit, and to the extent that any single page can reveal “the quality of the whole,” page 99 works pretty well for Indian Affairs and the Administrative State in the Nineteenth Century. My page 99 discusses the significance, and the effectiveness, of Indian affairs administration in the early decades of the nineteenth century. At the top of 99 I quote Josiah Gregg, a nineteenth-century trader, from his book, The Commerce of the Prairies. In the quotation, Gregg describes how a federal treaty signed with Osage Indians in 1825 helped create a safe environment for US citizens along the Santa Fe Trail. Treaties like this one solidified working relationships between US and Indian interests, and were legally required for any acquisition of land from Indians. The second half of Page 99 discusses the effectiveness of the factory system, a series of not-for-profit trading houses run by the federal government from the 1790s to the 1820s. The factories pacified Indian relations by taking trade away from independent traders, who were believed to be threats to peace on the frontier. The US drove independent traders out of business by underselling them (the government not seeking to make a profit), by driving up traders’ costs with federal licensing and bonding requirements, and by forcing traders to join large, presumably more accountable firms like John Astor’s American Fur Company. That’s right—the early federal government regulated land transactions and the fur trade, two giant motors of the new American economy. Just as page 99 suggests. The place and route [described by Gregg] remained safe, and “from the borders of Missouri to those of New Mexico not even an Indian settlement greeted our eyes.” That safety and the absence of Indians was a government-constructed outcome, and Gregg knew it. The freedom of the prairie described so movingly by Gregg toward the end of his journal—“the wild, unsettled, and independent life of the prairie trader”—was made possible by the prior action and continuing oversight of the federal government. Gregg knew that you couldn’t understand expansion or the nineteenth century without its Indian participants, and he knew that the federal government had been a central and active player in the nation’s life from the earliest days of the republic. Read an excerpt from Indian Affairs and the Administrative State in the Nineteenth Century, and learn more about the book at the Cambridge University Press website. Mark Valeri is the Ernest Trice Thompson Professor of Church History at the Union Theological Seminary and Presbyterian School of Christian Education in Virginia. His books include Law and Providence in Joseph Bellamy's New England: The Origins of the New Divinity in Revolutionary America and The Works of Jonathan Edwards, Volume 17: Sermons and Discourses, 1730-1733. Heavenly Merchandize concerns the religious changes that shaped a market economy in Puritan New England. The book focuses on the daily pieties of Boston merchants--how their religion shaped the ways in which they kept their business accounts, made deals, and scuffled for profits. Yet these pieties were informed by larger historical ideas. Page 99 drives to the heart of this matter. It recounts how a second generation Boston minister, Increase Mather, described New England during the 1670s. Earlier Puritans had claimed that God did miraculous things for New England, but they rarely claimed to understand the precise manner through which providence worked. They did not proffer precise predictions about political and social affairs. They thought that contemporary history revealed far less of God’s will than did the Bible. Mather was the leader of a group of Boston ministers who changed this perspective. In the midst of great public events--Indian wars, political negotiations with the Crown, economic troubles--he began to detect the action of God in contemporary events. As he did so, he began to equate New England with ancient Israel. Through sermons that since have become known as jeremiads, he claimed that providence was working to reform and vindicate the public order of New England, including its government and commerce, as an object of divine favor. As he did so, he asserted a predictable law: divine reward for social virtue and divine punishment for social vice. With such confidence that God was guiding New England, Boston merchants began to idealize their trade as divine instruments to bring prosperity to New England. Seeing God in their history, they rejected previous criticisms of usury and other market strategies based on the Bible. They embraced new techniques for trade. They made new business techniques a means to serve God as they served New England. In this sense, page 99 is one of the most theologically oriented pages in the book. It is not the most scintillating but it describes crucial intellectual changes that gave purpose to economic innovation. Read an excerpt from Heavenly Merchandize, and learn more about the book at the Princeton University Press website.